PALM BEACH GARDENS, Fla. — A Palm Beach Gardens neighborhood had plenty to talk about Monday morning! A large gator was found in a swimming pool at a home in the Marlwood Estates community on Graemoor Terrace, and had to be removed. Video from a neighbor shows a trapper hauling the huge reptile out of the pool and dragging it across the lawn. It's unclear how the gator got into the fenced yard, or how big it is. 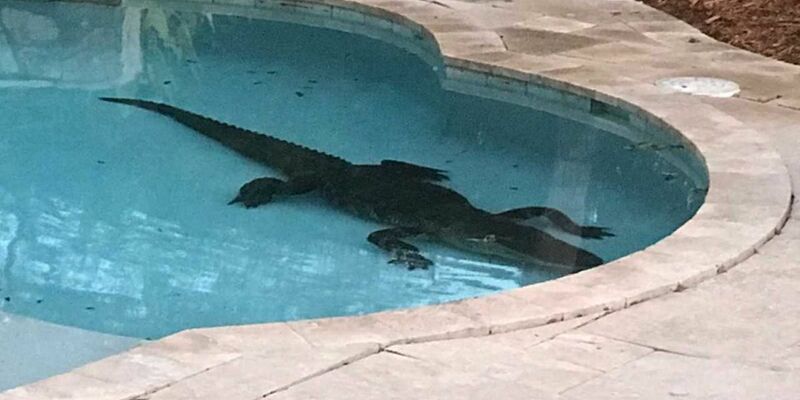 Vanessa Schultz said she was walking her kids to the bus stop around 7:15 a.m. Monday when she was told a large alligator was in her neighbor's pool. "It was big, really big," said Schultz, who captured images of the alligator. "I was totally in panic. When I saw the alligator I was scared." Schultz said she’s lived in Marlwood Estates for three years and has only seen a gator there once before. She said the an alligator was spotted in a lake last year behind her property. Schultz, a mother of three, thinks the gator in the pool was likely 9 feet long and over 300 pounds. "It totally concerns me. So now I’m scared and I don’t want to leave my kids outside playing in the backyard," said Schultz. "I also need to check the pool and check before going outside the house." The Florida Fish and Wildlife Conservation Commission said the gator was 9 feet long, and was relocated to a farm. "It concerns me. I don’t feel protected anymore," Schultz said. FWC said residents need to be extra careful this time of year because it’s alligator mating season, and the reptiles are more active.